Reiki is a Japanese holistic therapy for stress reduction and relaxation that also promotes healing of body, mind and spirit. It is administered fully clothed and by a light touch or hands just above the body. It is based on the belief that an unseen "life force energy" flows through us and is what causes us to be alive. If one's "life force energy" is low, then we are more likely to get sick or feel stress, and if it is balanced, we are more capable of being happy and healthy. Reiki is also a simple, natural and safe method of spiritual healing and self-improvement that everyone can use. It has been effective in assisting in the healing of virtually every known illness and malady and always creates a beneficial effect. It also works in conjunction with all other medical or therapeutic techniques to relieve side effects and promote recovery. Many hospitals, nursing homes and cancer treatment centers now offer Reiki sessions for the well-being of their patients. Your session is one hour. The first ten minutes will be to discuss your goal or intention for your session followed by a 45 minutes of energy healing and includes aromatherapy and your choice of music. The last few minutes will be for you to drink a bit of water and discuss your impressions before leaving. More than one session may be suggested to continue the process you began or you may have received what you needed in the one session. ​Reiki is beneficial for stress, pain, anxiety, clearing the mind, Chakra work and many other ways that your physical, spiritual and emotional body is out of balance. 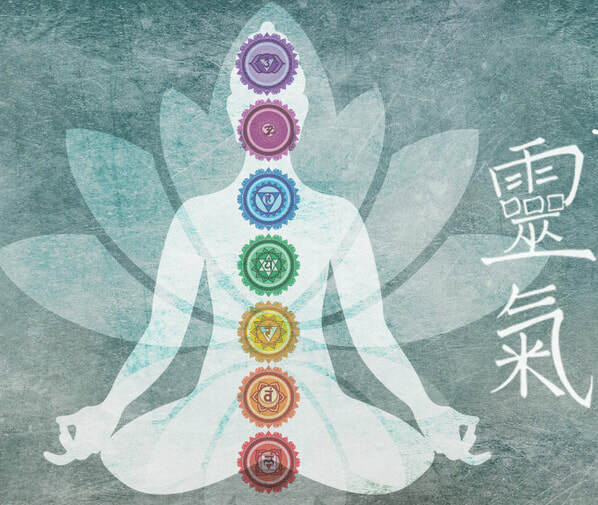 What Are Chakras & Why Balance Them?